Jasper, Alberta has a lot to celebrate. In January 2014 they celebrated their 25th annual Jasper in January festival with all kinds of fun activities that represent the outdoor life here. And, Marmot Basin the ski area just outside of town, is also celebrating fifty years! There is so much to do in Jasper, that even if you don't ski, this is one beautiful outdoor destination that gives you a lot of choices. All of Jasper is located inside Jasper National Park so there are tons of outdoor activities like hiking, cross-country-skiing, snowshoeing, ice-climbing, and fat-tire snow biking. A fun thing to do is go on a dog sledding adventure with Cold Fire Creek Dogsledding located outside of town. There are also wildlife tours on which you may spot a moose or herd of elk. Looking for something very different? The Maligne Ice Canyon walk is stunning with frozen waterfalls and caves. Of course, the biggest attraction is Marmot Basin, just twenty minutes from Jasper and in the heart of the Canadian Rockies. The breathtaking views and 1,675 acres of terrain seemingly all to yourself makes it among the best ski areas in North America. For a small mountain town, Jasper has a fairly diverse offering of food. This is town with chefs and cuisines from all over the world. Italian, Korean, sushi, it’s all here. Known as one of the best restaurants in Jasper, Tekkara Restaurant, inside the lodge of the same name, is expensive but well worth it for the gourmet cuisine in a rustic setting. Evil Dave’s Grill has chicken, meat and fish dishes with a twist and their cocktails are fresh and made from scratch. For good bar food, a fun atmosphere and great local brews, head to Jasper Brewing Company. Make sure to snack on some of that truffle popcorn. And of course, Tim Horton’s right downtown is as Canadian as it gets! Jasper is full of picturesque accommodations whether you’re in the heart of the cute, old western downtown or up in the mountains. 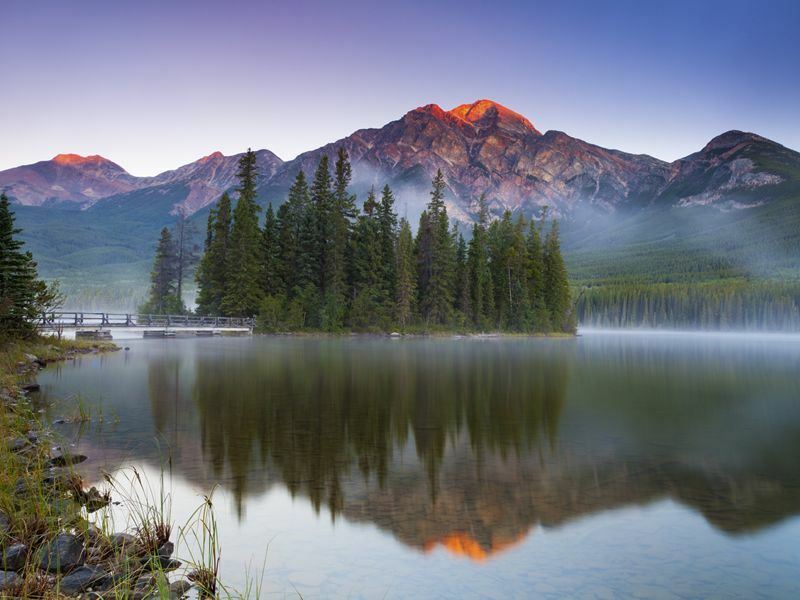 Fairmont Jasper Park Lodge is in a stunning setting surrounded by snow-capped peaks and sparkling lakes. If you’d rather be right on main street with it’s nearby shops, restaurants and bars a stay at Marmot Lodge is perfect. Or instead stay in the heart of nature at the Sawridge Inn Jasper right in the heart of Jasper National Park. The hotel has an assortment of spacious and comfortable rooms and deluxe suites, which were recently upgraded.